To post a new job you just need to sign up on our website. When signing up you have the option to select: "Recruiter" (an employer) or a "Job Agency". If you wish to post a job on behalf of other company please sign up as a “Job Agency”. After completion of the initial registration form, you will receive 30 free credits (value €300). You will be able to post 6 Standard Jobs or 1 Featured Job (moving banner on the front page and always visible on every page). If desired, you may split your free credits and post 1 Featured Job and 2 Standard Jobs. If you are satisfied about our service you may always purchase additional credits to publish more aviation jobs. NOTE: Buying 1 Featured Job will add 10 complimentary credits into your account, so you will be able to post 2 Standard Jobs free of charge. If you decide to buy 2 Featured Jobs, we will add 20 complimentary credits into your account, so it will give you the opportunity to post 1 Featured Job or 4 Standard Jobs for free. LinkedIn announcements - We are able to send aviation related announcements to all our LinkedIn group members. 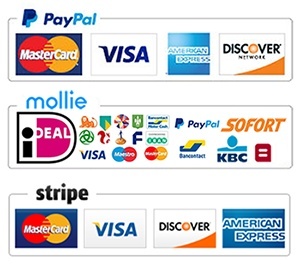 Our payment options are: PayPal, Mollie (eg: iDEAL, VISA, Mastercard, Sofort etc. ), Stripe (credit card) bank transfer and per invoice (postpay). Payment will be made through our payment providers: PayPal, Mollie and Stripe. All payments are guaranteed safe. PayPal, Mollie BV and Stripe are a Payment Service Provider (PSP). A PSP allows online retailers to offer various online payment methods, such as iDEAL, credit card, MasterCard and PayPal, in their webshop. For example, you can make your online purchases at these webshops easy and within a reliable, safe environment. All PSPs use SSL certificates. This means that you make your online transaction within a secure web environment.